We all know (assume) that the Disney Co. has no plans to expand the current monorail at Disney World. But have you ever wondered what it would take to make it look more like Walt’s original plan? Here we’ll study the costs and possible routes it might take. First step in this new project complete. I accurately modeled a span of monorail beam (26″x48-80″x~100ft). Digging through the interwebs for measurements was a task in its own right! 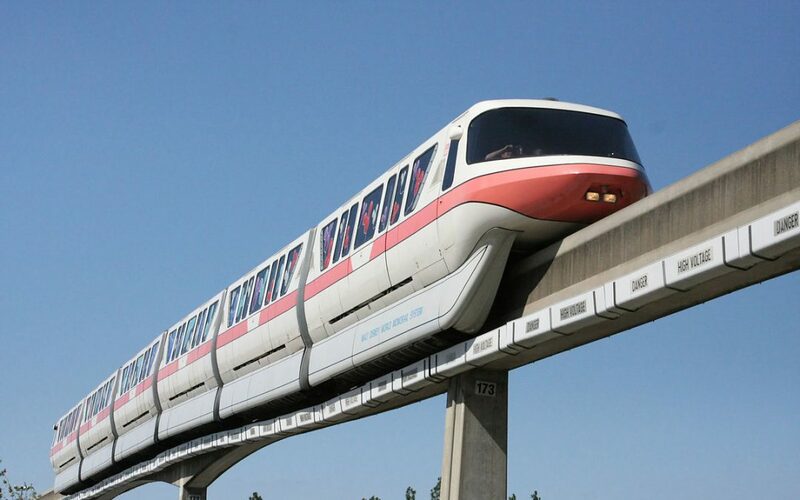 Step #2 – Draft new monorail line extensions down to Disney’s Hollywood Studios, Disney Springs, and Disney’s Animal Kingdom, while taking into account the efficiency of a PeopleMover system to spread the passengers out to nearby resorts instead of trying to push the monorail line to each doorstep. Step #3 – Calculate how many additional beams and supports might be needed for each extension. Step #4 – Find a professional to help estimate the cost! Working on the first curved section of the Seven Seas Lagoon / Resort / Magic Kingdom monorail loop. Making curved sections was easiest in 3D Studio Max, so I took a 100ft straight section, added a bend modifier to it, and copied it several times, increasing the bend amount by 5 degrees each time. Now I have a nice little family of curved monorail beam sections from 5 degrees up to 35 degrees. I love the work so far. I would love to see a monorail expansion as well. That said, might I suggest looking at some of the newer monorail beam support ideas as well as other types of beam. Since 1970 we have made a lot of strides in construction materials. Using concrete with plastics embedded and re-bar substitutes can save weight, add strength, and reduce costs. We all love the way the monorail looks as a system but using the current configuration of train and track might not be the way to replace/expand the system. The projects in Brazil and Thailand are examples of greatly reduced per mile costs over the Disney type system. Check out http://www.monorails.org/index.html I am not a member but they have lots of cost details on variations. Love the feedback! I’ve seen cost per mile numbers all over the board, even big differences between relatively recent monorails such as the Vegas expansion ($85mil vs $150mil). I would bet the cost would be lower for Disney not having to worry about right of ways, even if they have to work with swampy areas. I’ll dive into the Monorails.org site. It’s been a while since I looked through their pages, and we all miss Kim’s great work.